Delrey Metals Corp. (CSE:DLRY) is a growing mineral exploration company powered by a focus on battery metals. It has acquired the Star, Porcher, Blackie and Peneece vanadium properties in British Columbia and intends to review and acquire other projects showing potential for materials used in strengthening alloys for steel and titanium, as well as energy storage and electric vehicles. Last year, the company completed Phase 1 work at the Sunset property in British Columbia, which showed a significant new cobalt, copper and zinc anomaly. Delrey has an option agreement to purchase a 100% interest in the highly prospective property. 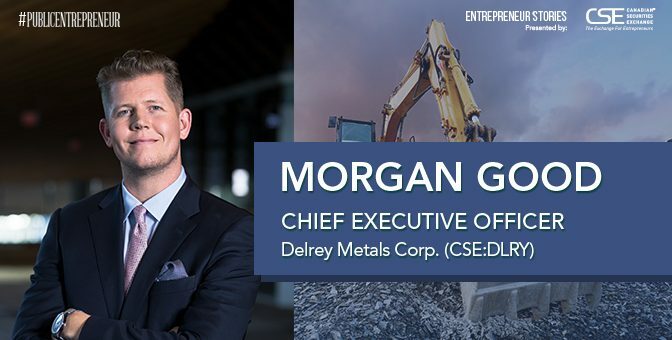 On the heels of raising $1.5 million in Delrey’s October IPO, chief executive officer Morgan Good is excited about the company’s prospects. Public Entrepreneur caught up with him and got his take on mining, finance and commodity prices. How did you get into the corporate world? I was born into a stock brokerage family. Several of my relatives were floor traders, brokers, promoters or financiers. Growing up, I played competitive golf at Point Grey Golf & Country Club in Vancouver, where those relatives and other supporters gave me a deep understanding of money and the stock market. As a teenager, I had a serious interest in finance and venture capital. What are your company’s most important projects? All of Delrey’s current projects are important, particularly our recently acquired vanadium- focused assets. Of those, the Porcher and Blackie properties have unique features that jump out. We’re initiating geophysical work and airborne magnetic surveys on all four of the vanadium projects and are keen to see Phase 1 results. From there, we’ll be in a much better position to decide next steps. I think it’s worth mentioning that we are in advanced stages of making a strategic acquisition that could add significant value to the Delrey story. Delrey’s Sunset project is near the Whistler Blackcomb ski resort. Do you ever have time for outdoor activities such as skiing or hiking? When I travel for business, which is quite frequent, I like to try and enjoy activities that are consistent with the parts of the world I’m in. Being born, raised and currently living in Vancouver, skiing and snowmobiling are two outdoor Whistler activities I enjoy. But I do like warmer locales near a beach or desert. This isn’t your first job as a CEO. What was your previous gig like? I was previously CEO of ALQ Gold Corp., now ‘Ignite International Brands Ltd.’, a company focusing on cannabis-related investments. Dan Bilzerian, the celebrity poker player, is now CEO and Chairman after we assisted in launching his global cannabis brand, Ignite. My complete focus is now on Delrey. You founded Patriot Capital in 2013 to invest in public and private companies. What were the highlights of that? Patriot is my private firm that invests directly in every entity I attach my name to, thereby aligning my personal investments with my professional efforts. Patriot also takes positions in several other, primarily public companies and has profited in many areas. Included are mining resources in the Yukon Territory and British Columbia’s Golden Triangle, as well as notable cannabis plays, which, as you know, have boasted monumental returns for investors. What was it like going through Delrey’s IPO? Your company raised $1.5 million in October, right? Creating Delrey and conducting its IPO was a great experience. We’re fortunate to have been able to work with an incredible management team, legal team and, of course, our sponsoring brokerage firm: Leede Jones Gable Inc. It assisted very closely in our launch. I have to give a lot of credit to the Canadian Securities Exchange and British Columbia Securities Commission for making the journey efficient, informative and educational. Delrey closed on $1.5 million last fall and began trading October 24. How much cash does Delrey have on hand? How long is it funded based on the current burn rate? Any other big fundraisings on tap? Currently Delrey has about $1.4 million in the treasury. Our initial commitments technically and corporately are minimal as we roll out Phase 1 on our British Columbia vanadium assets. Once we make our next major move, you’ll see the capital requirements increase and at that time we’ll make the necessary plans for further financing. Vanadium prices have dropped since an impressive spike upward last year. What’s your outlook for that market? What goes straight up must come down, as the price of vanadium proved. It was a healthy correction, and the price has since consolidated and started moving back up. We believe the outlook for the commodity in 2019 and beyond is more than positive and the market will continue to see bullish signs from the metal. What can we expect from the battery metals industry in general? We will see a lot more excitement in the future. A major catalyst is China’s new laws requiring more vanadium in steel alloys used in the country’s construction and infrastructure buildouts, which are mind-boggling in size. At Delrey, we believe vanadium redox batteries will jump from the current 1% to 2% of vanadium consumption and usage. Learn more about Delrey Metals at https://delreymetals.com/.